It’s thrilling to be able to grow these beautiful evergreen shrubs with blooms resembling roses or even peonies. Rhododendrons, another popular Asian import, sometimes suffer from frosts, diseases or pests, turning ugly and dying young. Camellias, on the other hand, seem impervious to these threats. Just about the only way to damage them is to expose them to too much sun in which case their leaves will burn and curl. Occasionally, the varieties that bloom in January and February get caught by a prolonged frost, resulting in the gorgeous blooms turning – overnight – into hideous, waterlogged brown blobs. Sad, but not fatal. Even in the severest winters camellia foliage remains green and undamaged, and if the buds don’t get zapped they’ll open to perfectly formed flowers. There are more than 250 species of camellias, but only a few of them are widely available through nurseries. Not to worry. Your choices are practically limitless as there are literally thousands of named hybrids and their number increases every year. Camellias are grown for their showy, long-lasting blooms that can be white, pink, violet, red, yellow or two-toned. Flowers can be large or small, single, semi-double, pompom, anemone-form, peony-form or rose form. Most comprehensive gardening books will contain illustrations or photographs of the various shapes. 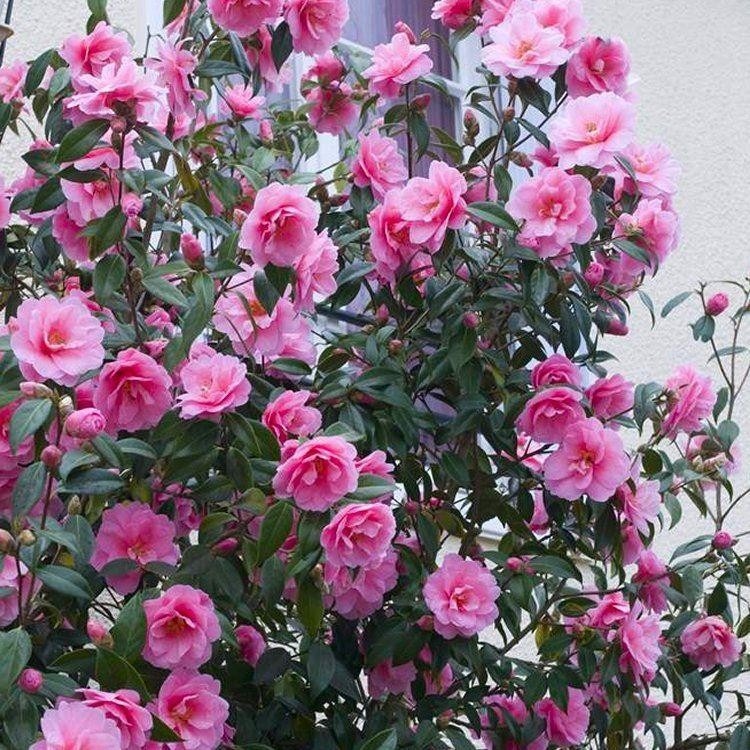 Camellias will thrive in either acid or neutral soil. They require good drainage, deep watering and a shaded position. Feed them a balanced fertilizer (20-20-20 or 30-30-30) after they’ve bloomed and again in July. Water them thoroughly once a week over the summer and increase the dosage in autumn to encourage bud growth for the coming spring. If the shrubs are not planted in deep shade, mulching will help keep their roots cool and the plants to retain water. With a little planning you can have camellias blooming in every season of the year except summer. Most species and hybrids flower for at least four weeks. And even when they’re out of bloom, camellias are handsome, stately shrubs with distinctive foliage, adding elegant structure to shaded borders and woodlands. 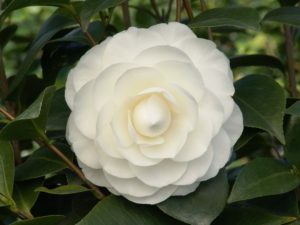 Camellias can be planted singly, in groups or used as screens and hedges. They are easily espaliered, will thrive for many years in containers and need little if any pruning. Ideally, they should be planted in dappled shade but they’ll flower equally well grown in deep shade or where they get morning sun. If you are going to plant them in the open, make sure that the site faces east or north in order to prevent the leaves from scorching. Rhododendrons, azaleas, pieris, fothergillas, mock oranges (Philadelphus) and other shade-loving shrubs make good companions. Hellebores, bleeding hearts, meadow rues, primulas and other perennials that don’t need a lot of light also can be grown in close proximity to camellias. The most widely planted camellias are C. japonica hybrids which can mature into small trees 15 to 25 feet high. Camellias are slow growers for the first three or four seasons but then grow fairly rapidly, adding about a foot in height each year. Camellia sasanqua hybrids have smaller leaves and flowers than their japonica cousins and bloom earlier – from October through December – and some are slightly fragrant, while C. japonica varieties come in early, mid and late-spring bloomers, so a combination can create a show from fall through early spring. With their splendid blooms, polished foliage and ability to flower in deep shade, camellias are true garden gems. And the cut flowers floating in a bowl of water are simply exquisite.